Feb 28 Time on my hands! I have one of those unusual days today when I have time for me. Time to do the things I want to do rather than those things I have to do! Very precious. I've offered to do a simple jewellery making workshop for a group of women in a couple of weeks time and so went down to look through my books for inspiration and ideas. Whilst there, I came across a book given to me at Christmas by dear Kiwi friends Fiona and Wayne and realised that, although I had read it from cover to cover when I first had it, what a great book it is! 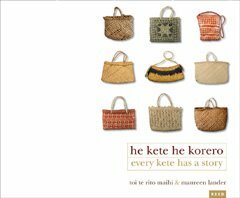 Every Kete Tells a Story is about the little traditional Maori baskets woven by women, and there's a story with each about how they were made, where they were used and so on, along with a close up photo of the design and a great photo of the maker or present owner, which somehow brings the whole thing to life. It reminded me of someone who did a textile project about handkerchiefs and the tales they could tell. I'm not generally interested in history, but I do like to learn about people and the lives they led and think these small items of such a personal nature reveal much about the people who made, used and enjoyed them. Feb 28 Giving up on these tulips!